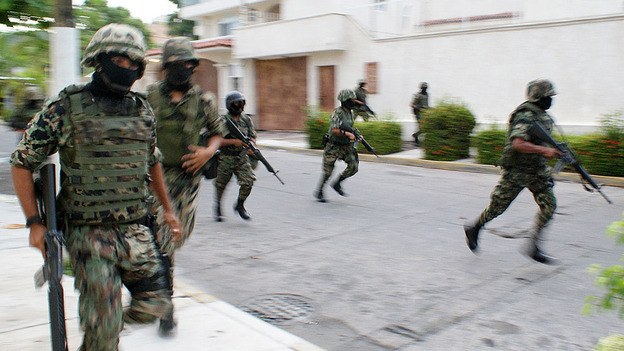 The drug war in Mexico is escalating. President Calderon is not giving up, and Hilary Clinton our secretary of state is promising to help. But are they barking at the wrong tree. President Calderon has a point when he calls the US a drug addict; we comprise 5% of the world’s population and consume 33% of the drugs produced. We may well be the primary cause of the problem. Lets examine the facts: The recent economic collapse (just like the great depression) was caused by greed and lack of ethics in Wall Street and the Big Banks; BP is still trying to fix the oil leak they caused in the Gulf of Mexico due apparently to irresponsible and reckless behavior, and which is causing untold ecological damage and heavy financial losses in many areas of Florida and Louisiana. And now our drug addictions are fueling a war that is killing thousands. It seems like our religions are owned by our collective ego; we really don’t trust any God; we only trust money and power, and want them at any cost. Lets face it, spiritually speaking we are a third world country. Porfirio Diaz an infamous Mexican President once said: “Poor Mexico, so far from God, so close to the United States.” He may have been right. As a temporary solution (improving our morals and our inner balance will take a while) we could legalize drugs as a way to destroy the mystique surrounding their purchase, and as a way to be able to offer help to whoever buys them. Is this too farfetched? We would be also collecting taxes, which would help our economy. And there would be no reason for drug wars. Implausible? Please advise me.